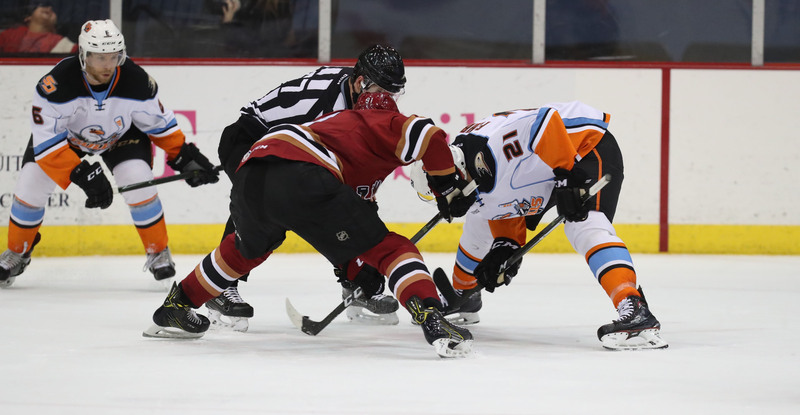 In seeing a two-goal lead in the final period dissipate, the Roadrunners fell to the San Diego Gulls by a 5-3 score Wednesday afternoon at Tucson Arena. Starting early wasn't the problem - maintaining things late proved to be. Coming into the day, the team owned a fantastic +18 scoring differential in third periods this season, outscoring their opponents by a 47-29 mark. Wednesday was different, though, as the Gulls outscored the Roadrunners by a 4-0 count in the final 20 minutes of play. The day's affair marked the Roadrunners’ first regulation loss of the season when leading after two periods – they were 11-0-0-1 in such circumstances prior to the game. The Roadrunners took a 1-0 lead at the 13:22 mark of the first period when Mike Sislo scooped up a loose puck as San Diego was exiting their own zone and walked in to beat Reto Berra with a shot against the grain to record his 12th goal of the season. Sislo’s goal extended his points streak to five games – currently the longest of such on the club. He’s totaled six points (2G, 4A) during the stretch. Just over eight minutes into the second, Mario Kempe gave the Roadrunners a 2-0 lead when he received a Jens Looke pass as he fled toward the net on a two-on-one sequence, making a nifty move to his backhand to register his fourth goal of the season. Less than a minute later, Michael Bunting won a battle for a puck at the top of the slot in San Diego’s zone and fired home a wrist shot to give the Roadrunners a commanding 3-0 lead with 10:25 to play in the second. 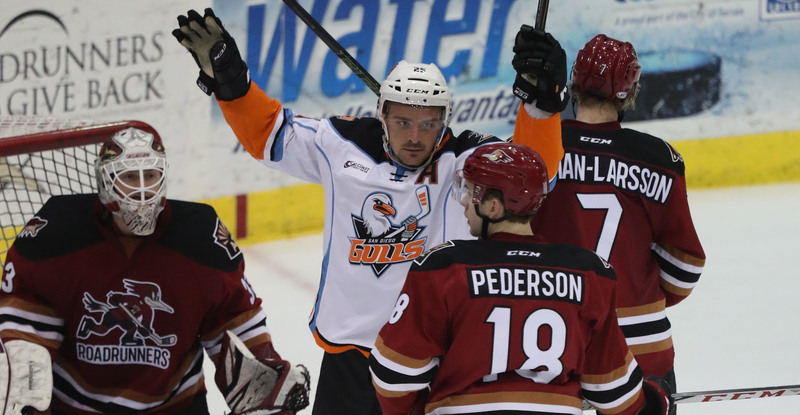 The Gulls would then rally for five unanswered goals, including a natural hat-trick from Giovanni Fiore in the third period to defeat the Roadrunners by a 5-3 score. The loss snapped the team’s four-game win streak against the Gulls, the first of such to their division rival since November 18. Adin Hill stopped 21 of the 25 shots he faced in the loss. The team will now venture out on a two-game road trip, which begins Friday night when they take on the San Antonio Rampage at the AT&T Center, where the puck is scheduled to drop just after 6:30 PM MST.